Over the last five years, GO service has gone from 1094 trips per week in 2012, to 1709 trips per week in 2017. Metrolinx is investing in growing the GO Train network to support 6,000 trips per week by 2025. GO is committed to taking people further, faster, and more often than ever before. On a typical weekday, GO runs 272 train trips that accommodate 217,000 boardings, and 2,318 bus trips that accommodate 67,000 boardings. When you add up the numbers, you're looking at approximately 268,000 passengers travelling through the GO system on any given weekday. 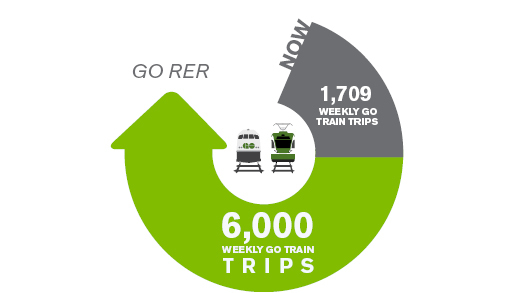 And those numbers are set to grow dramatically through our plans to expand and improve GO service. All GO Trains in operation today are diesel push-pull trains with 6 to 12 bi-level coaches. 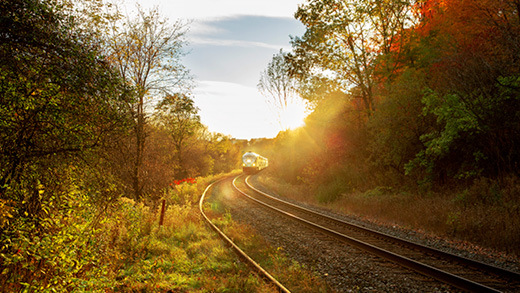 Our two-way, all-day services run every half hour on the Lakeshore East and Lakeshore West lines, with even more frequent 10- to 15-minute service during the busy morning and afternoon rush-hour periods. Hourly midday service has been running on the Kitchener line to Bramalea since September 2015, year-round weekend service on the Barrie line since December 2016, Stouffville midday train service since June 2017, and most recently hourly train service was introduced on the Barrie line between Union and Aurora in December 2017. With a projected ridership of over 127 million by 2029, GO is expanding to keep up. GO has spent the last half-century taking you closer to the places you want to go. Take a look at all the ways Metrolinx is working to ensure GO will take you even further in the future, by checking out our future service.